Barely a few weeks on from when Britain's housing market bears were starting to reappear on the scene in the mainstream press with perma doomsday headlines that followed Februarys 1.5% plunge and on the back of news of a fast slowing UK economy. Now out pops the Halifax with its latest data that show average UK house prices have once more accelerated to above 10% per annum! By galloping ahead by a whopping 2.6% for March near double Februarys 1.5% drop, and despite Februarys drop are up by 2.9% so far thus year which converts into an annual inflation rate of 11.6%. So what drove March's panic buying ? The clocks counting down to doomsday for Britain's buy to let sector as the latest announcement in a long list of measures such as the scrapping of mortgage interest tax relief are all aimed at whittling away the profits of buy to let landlords, and now a stamp duty tax hike is set to come in force from April 2016. That of an EXTRA 3% stamp duty tax charged on all additional owned properties i.e. all second homes that will hit buy to let sector investors when buying properties, a tax hike to raise an estimated £1 billion extra per year. The following table illustrates the effect of the increase in stamp duty from April 2016 which will especially hit the bottom end of the housing market where for instance tax on a £150k property will jump from just £500 to £3,800, an increase of £3,300! Which is precisely where George Osborne wants to target the most pain so as to increase the supply available for first time buyers that buy to let landlords have been soaking up for many years. The clear strategy is for buy to let investors seeking to expand their portfolios to act before the April 2016 tax hike, therefore this could result in a temporary surge in house prices over the next few months, especially at the lower end of the market which will be set against those buy to let landlords who have had enough and decide to sell their portfolios into temporary strength before the next negative measure is announced. Of course there is one way for landlords to avoid the tax hike as was the case for avoiding the end of mortgage interest relief which is to INCORPORATE. And the latest bad news to hit the UK buy to let rental property investment sector was the announcement from the Bank of England to make conditions on buy to let mortgages much more stringent by going beyond the current norm of just mortgage interest being covered by the anticipated market rents, instead it has been proposed that at a minimum rent should be at 125% of mortgage interest payments, as well as taking into account all other costs incurred such as repairs, tax and voids, as part of a continuing trend to to make more properties available to first time buyers, that property investors have been busy buying up for well over a decade that has resulted in making it near impossible for first time buyers to step onto the bottom rung of the property ladder in many areas of the UK. To date approx 40% of the right to buy council homes have ended up in the hands of private landlords who then rent out these properties to those on benefits or low incomes. So whilst Council house tenants and soon to join them Housing Association tenants are in receipt of 70% discounts (bribes) of upto £102,000! Those in private rental accommodation get NOTHING! In fact the rents in the private sector tend to be substantially higher than for social housing and the properties also on average tend to be in far poorer state of repair. Therefore at the end of the day the winners will be private landlords as the supply of buy to let sector properties increases. Meanwhile those waiting on the ever expanding housing lists are going to face even less choice as now even housing association properties will soon start to evaporate so that all that will be left will be some 6 million private landlord rental properties. The big question mark is what bribes will the politicians come up with to appease the 6 million private rental households? Will a future government announce the right to buy your private rental property, especially as it would be a relatively easy votes winning calculation for a left of centre party to make. Something for today's would-be landlords to ponder the consequences of as they mass property empires that they could be forced to liquidate. Therefore the Conservative government is continuing to lay the property market groundwork for the 2020 General Election, one of far higher supply of first time buyer properties, all without significantly increasing the construction of new builds as effectively many hundreds of thousands of today's renters become property owners, which paints a bleak picture for buy to let investors as each year many new measures are announced that chip away at profit margins until they turn into losses that mushroom into unserviceable debt mountains and thus are forced to sell. So if your a buy to let investor, don't stick your head in the sand and think things are going to get better, they are NOT, instead things are going to get MUCH worse and if your hands already not very strong, then it may be wise to think about exiting before you are forced sell at a significant loss. The current assault on the Buy to let sector just confirms that ultimately the trend is towards a buy to let doomsday, that of the right to buy scheme being extended to private sector tenants. The Non seasonally adjusted UK house prices momentum shows that after a post election slowdown to 7%, momentum has once more steadily increased to an inflation rate of 11.1%, now at its highest rate since the last housing bull market! Therefore the effective house prices momentum range is between +11% and +7% which implies to expect an average annual house price inflation rate for 2016 of about 9%. Therefore don't expect any follow through on March's surge higher to 11.1% as the buy to let sector frenzy is over! Instead I expect house price inflation to fast slow to a more sedate pace of about 8% pr 7% per annum. What the academics and mainstream press commentators persistently fail to comprehend is TREND, or more precisely the TREND in AFFORDABILITY. The trend over the past 40 years has been for the proportion of household earnings spent on housing costs to rise from 20% 40 years ago to an average of 35% for Dec 2013, which is trending towards 50% by 2030. This is the big story that the academics have missed as over time, decades in fact people are gradually becoming conditioned to spend more and more of their earnings on housing costs as being the norm which the government subsidises through benefits such as tax credits and housing benefit. The reason why I expected affordability to trend ever higher again has its roots in the exponential inflation mega-trend as workers relentlessly face a loss of purchasing power of earnings and savings due to reasons such as the Inflation of the size of the population that is MOSTLY as a result of continuing out of control IMMIGRATION, as evidenced by the baby boom now underway mostly amongst migrant families of the past 15 years that acts to relentlessly put pressure on housing availability where annual construction (new builds) are not able to keep pace with even half of the new demand generated each year. Therefore workers have no choice but to commit an ever larger proportion of their earnings towards housing costs, the effect of which is that housing bear market affordability troughs are being ratcheted ever higher, which has left many academics confused as they remain fixated on their theoretical models that imply house prices must fall so as to return to affordability levels of past troughs as the real world trend passes them and their models by. The updated affordability graph (Dec 2015) shows the underlying relentless trend of affordability being once more ratcheted higher that looks set to breach the 2007 bull market peak during 2016 i.e. 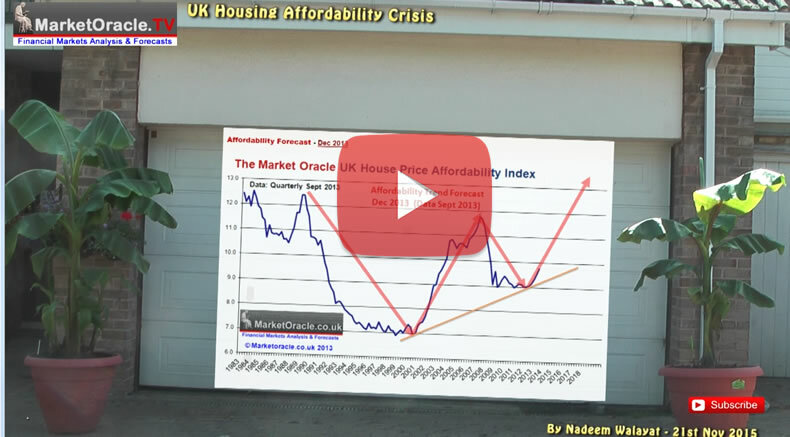 house prices this year will be even more unaffordable then they were right at the very peak of the last housing bull market mania! UK average house prices (£212,859) are currently showing a 3.6% deviation against the forecast trend trajectory, which if it continued to persist then in terms of the long-term trend forecast for a 55% rise in average UK house prices by the end of 2018 would translate into a 9% reduction in the forecast outcome to approx for a 46% rise by the end of 2018. The bottom line is that house prices are going to continue to get ever more expensive where those who are waiting for a crash to more affordable levels will continue to regret not buying as the only way housing can even start to become more affordable is if the UK literally triples the number of new builds each year from approx 140,000 per year to 400,000, something that is just not going to happen as it would literally mean the government undertaking to build a new major city EVERY YEAR! Instead it has been over 40 years since the last new town let alone city was built. In my opinion I think it is inevitable that eventually the government will be forced to build a series of new towns that will grow into new major cities that should be announced over the coming years, which whilst encouraging economic growth will however also encourage further mass immigration, so even a series of new towns and cities may only make a marginal short-term difference to UK housing market affordability ratios. The bottom line is that whilst the bull market currently remains on track to run for several more years, nevertheless don't forget that at the end of every bull market lies a BEAR MARKET, just as I warned in the months leading up to the August 2007 bubble peak that the clueless mainstream press remained blind to for at least another YEAR! With garbage headlines for a soft landing rather than the unfolding crash.